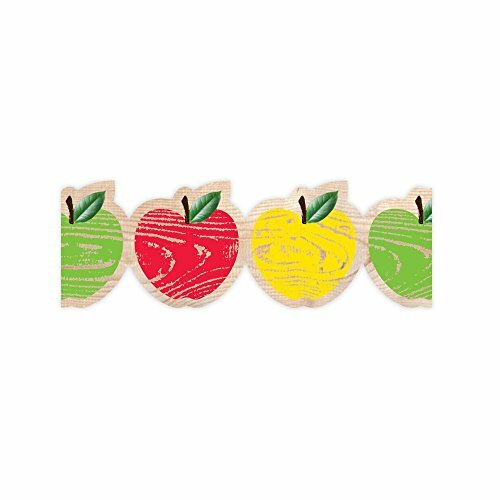 Fresh and sweet, Rustic wood-looking Apples are a classic accent in any classroom. 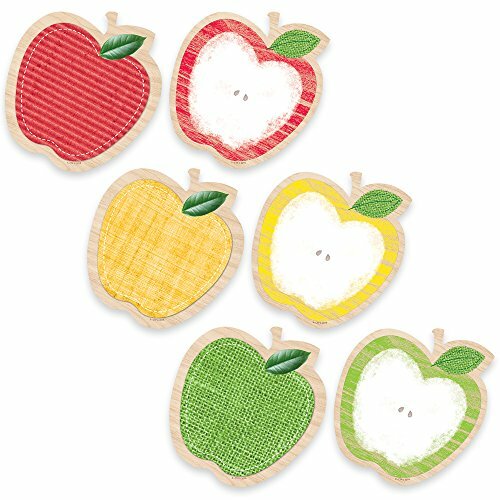 These Cute die-cut Apples have a "mixed-media" feel with their rough-textured paint, layers of Burlap and colored canvas, along with the woodgrain background. 6 each of 6 designs 36 pieces per package approximately 6" coordinates with other upcycle style products. They are a fun accent for bulletin boards, classrooms, hallways, offices and common areas! the 6" size is perfect for crafting projects, displaying photos and work, making covers for books, seasonal/holiday decorating, classroom organization/labeling and more! 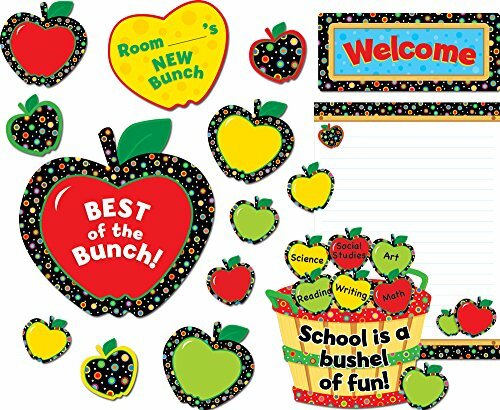 Decorate your classroom with these fun apple designs! Cut-outs can be used for more than decoration! Use them for game pieces, to brighten up cubbies, fun name tags, reward cards and much more! Die-cut shapes are fun additions to any classroom setting! 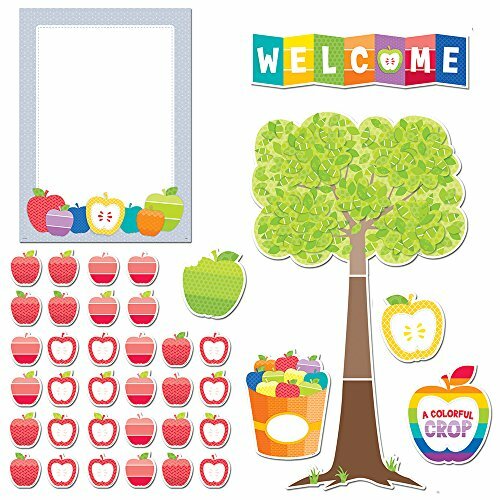 They are perfect for bulletin boards, walls, windows, in matching and sorting games, as name plates or desk tags, and more! Each shape measures 4.5" x 5.5" and is printed on card stock; each set includes 36 cut-outs in 3 assorted colors. Fresh and sweet, Rustic wood Apples will brighten any bulletin board. 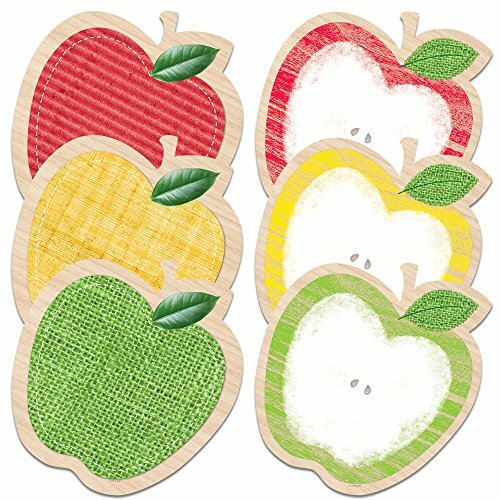 These Cute die-cut Apples have a nostalgic familiar feel with their woodgrain-like background and rough textured paint. The realistic looking shiny Green leaf accents the design for a mixed media feel. 35 feet per package width: 2.75" coordinates with other upcycle style products. Border idea: add style and pops of color to any bulletin board by mixing, matching and layering our solid and patterned borders. This simple trimmer idea will make your bulletin boards really stand out! 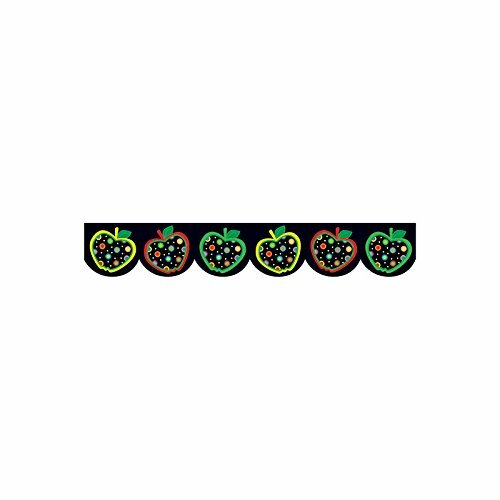 Add some fun to bulletin boards, doors, and common areas with this colorful border. 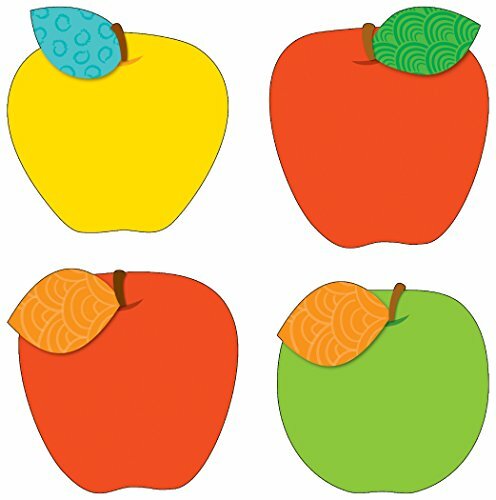 Apples 10" jumbo cut-outs will make a "sweet" addition to your classroom decor! these die-cut Apples have a "mixed-media" feel with their rough-textured paint look along with layers of Burlap and colored canvas, along with the woodgrain-like background. 2 each of 6 designs 12 pieces per package approximately 10" coordinates with other upcycle style products. 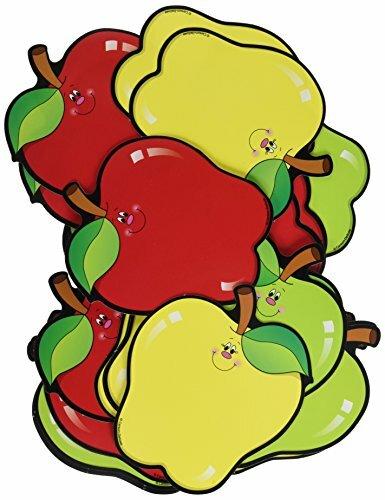 Add these Apples jumbo cut-outs to bulletin boards, classrooms, hallways, offices and common areas! the 10" size is great for crafting projects, displaying photos and work, making covers for books, seasonal/holiday decorating, classroom organization/labeling and more! Looking for more Apple Bulletin Board similar ideas? Try to explore these searches: Band Green Earrings, First Aid Surgical Tape, and Vera Wang Chocolate.